Often "ted by Chuck Swindoll, Charles Stanley, Billy Graham and other great preachers, A. W. Tozer's words are being heard and read by millions today words like: "Origin is a creature word... All things have an origin. But when you come back to God, you come back to the One who has not origin. He is the Cause of all things, the uncaused Cause. God is Transcendent." "You'll never find Him on your own... He is far away in one sense, but in another He is as near as your heartbeat, for the cross has brdiged the gulf." "If there is anything God could learn, it would mean that God didn't know it before. If he didn't know it before, then He didn't know everything, He wouldn't be perfect, and if He isn't perfect then He isn't God." The chapters of this book were originally preached as sermons at Avenue Road Church in Toronto, ON. Whether spoken or written, Tozer's words were designed to "promote personal heart religion" among God's people. - Publisher Continuing the journey into the Father's revelation of Himself. Explores 10 additional attributes of God including omnipotence, wisdom, sovereignty. 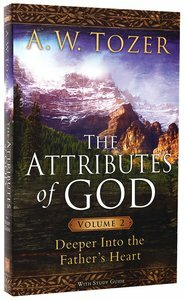 The Attributes of God Volume 2: Deeper Into the Father's Heart, speaks to God's Self-Existence, Transcendence, Eternalness, Omnipotence, Immutability, Omniscience, Wisdom, Sovereignty, Faithfulness, and Love. A.W. Tozer writes urgently in his introduction to this second volume of The Attributes of God. "Nothing less than this will save us." Originally preached as sermons to the Avenue Road congregation in Toronto, this study of ten more attributes of God restores our knowledge of who God is. A study guide has been added for an in depth look at each attribute. About "The Attributes of God (Vol 2 With Study Guide)"
Continuing the journey into the Father's revelation of Himself. Explores 10 additional attributes of God including omnipotence, wisdom, sovereignty.